Preregistration with full payment in advance is required for each class or workshop. Enrollment is limited; register early to reserve your space. Each of our multi-week classes offers a comprehensive curriculum designed to be attended in its entirety; therefore, there are no reduced rates for attending fewer sessions of the class. PEP reserves the right to cancel any class or workshop at any time. Classes with fewer than 10 participants may be cancelled. 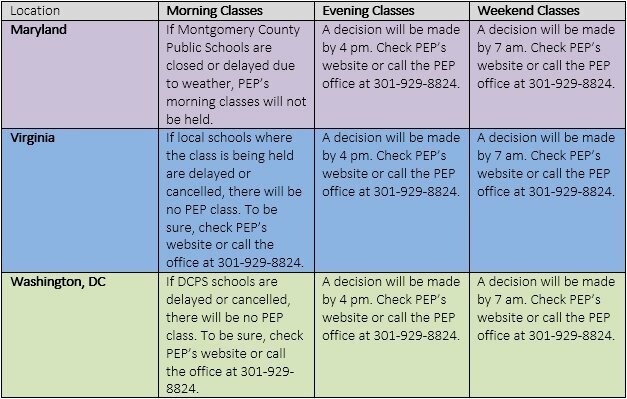 Registration and childcare fees will be refunded in full if the class is cancelled by PEP. Class (6-10 meetings): If you cancel your registration at least 48 hours before the first class meeting, you will receive a refund minus an administrative fee of $15 per person per class. If you withdraw after that, but before the second meeting, we will refund 75% of the tuition. There will be no refunds after the second class meeting. Intensive Class (an 8- to 10-week curriculum taught in fewer meetings): If you cancel your registration at least 48 hours before the first day, you will receive a refund minus an administrative fee of $15 per person per course. There will be no other refunds. Shorter Class or Workshop (1-4 meetings): If you cancel your registration at least 48 hours in advance of the event, you will receive a refund minus a $10 per person administrative fee for a class of 2-4 meetings and a $5 per person administrative fee for a workshop, single-session talk or Open Forum Counseling session. There will be no other refunds. Scholarships and Payment Plans Call the PEP office at 301-929-8824 or 703-242-8824 for information on payment arrangements and scholarships for classes and workshops. For those classes requiring textbooks, unless otherwise stated you will not need your book before the first class. Although advance purchase is not required, we encourage you to pay for the book when you register for the class. Books will be available for pickup at the first class meeting. Within each core class, the material taught builds on prior class meetings, so attendance is key. PEP strongly recommends that you register for a multi-week class only if you are able to attend at least one of the first two class meetings of a 6- to 10- week class or the first meeting of an intensive class. For the same reason, PEP does not permit an alternate person to attend a class in your place. In PEP’s core classes (PEP I, PEP II, Parenting in Perspective, Parenting Preschoolers, More Tools for Parenting Preschoolers and Thriving with Teens) up to two class meetings can be made up during the following session. Call the PEP office to arrange a makeup. Alternatively, a spouse or partner can attend to take notes for an absent registered parent, after letting the office know, but this is allowed no more than twice in a 6- to 10-week class, once in a 4-week class. It is not allowed in any 2-day or 3-day intensive class. The parent is asked to take notes only, and to refrain from comments and questions. Absences in shorter classes cannot be made up. If you would like a letter certifying your attendance at any PEP class or workshop, please contact the PEP office at least one business day in advance of the class you plan to attend. For certain classes, including Managing Anger: A Parent’s Guide and Limit Setting, letters of attendance are not available. Check the top of our Home page for a weather alert. You can also call the office at 301-929-8824 or 703-242-8824. For calls after 5 pm, we will leave a message stating the status of classes. NOTE: Power outages affect our voice mail system. If the phone rings six times with no answer or message, the power is out at the Kensington office.